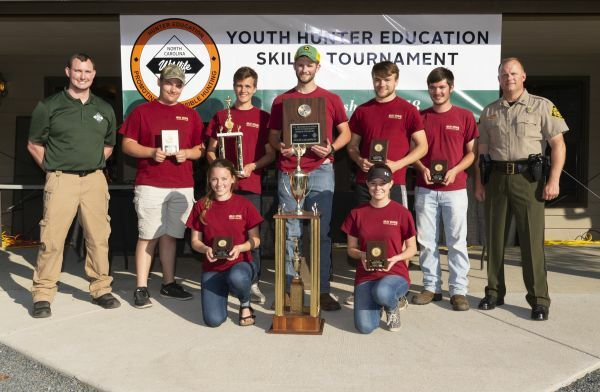 A high school from Stanly County and a middle school from Perquimans County took top honors at the 2018 Youth Hunter Education Skills Tournament on Saturday, April 28. The annual pre-collegiate tournament, facilitated by the N.C. Wildlife Resources Commission and its Hunter Education Program, allows youth to showcase outdoor skills and demonstrate safety techniques that they learn in the program. The state tournament is held annually at the John F. Lentz Hunter Education Complex in Richmond County. For the second straight year, Gray Stone Day School’s Garnette team won the senior division, scoring 3,627 points out of a possible 4,000. Perquimans County Middle School won the junior division with an overall score of 3,406. Students competed in four events throughout the day, including archery, rifle and shotgun marksmanship, along with an orienteering and written hunter responsibility test combination event. Teams compete on senior (high school) and junior (middle and elementary school) divisional levels, with overall team and individual awards based on aggregate scores in all events. Approximately 575 students from 60 teams participated in this year’s state tournament. They advanced from their regional tournaments, held in March in nine districts across the state. The teams are made up of individuals from public and private schools, as well as home-school associations and 4-H Clubs. The North Davie Middle School team was awarded the Fred Rorrer Trophy for sportsmanship. The trophy honors its namesake, a longtime hunting education instructor and Commission employee who passed away in 2010. Rorrer is remembered for his dedication to conservation and leadership in the youth tournaments. For tournament results and additional information, go to www.ncwildlife.org/YHEST or call 919-707-0031.